Parkerhill Reality Labs employs developers take part in the Unity community. While developing, everyone is encouraged to post their findings on the Unity Forums and give feedback to the Unity Product Team. Members on the team have also published books and have taken part in Hackathons. 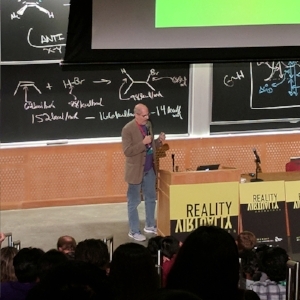 Adrian Babilinski accepting an award at the Reality Virtually Hackathon. Jonathan Linowes greeting attendees to the 2018 Reality Virtually Hackathon.